I see less of the sky in the summer because of the canopy from deciduous trees where I walk and live. I debated if this shot counted as sky watching but decided it did in a strange way. Click for the home of Sky Watch Friday. Looks like a lovely day to be off and running. what a beautiful spot for running or walking. 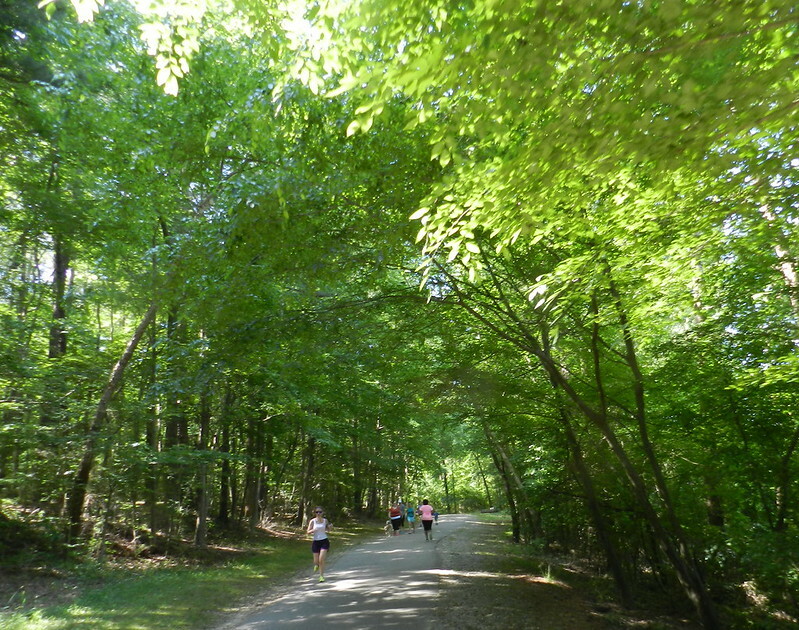 The canopy sure makes a beautiful spot for walking and running. It is indeed a beautiful place and fun to peek through the trees and see the skies! Wonderful capture, Carver, as always!! I love all the green trees, such a pretty time of the year! Have a happy weekend! Nice place for jogging and walking. It does count! I love catching glimpses of the sky through a tree canopy. Great place to walk! Beautiful place to be running! I would really like to spend some time under those trees! A hidden sky! :) Its a wonderful place! Looks like the perfect place to jog! It's really a lovely scene. The trees almost form a tunnel and I bet the shade is welcomed!